After our last couple weeks of wind storms most of the leaves have been blown from the trees. This allows the Liquidambar styraciflua to really stand out as they are usually the last large tree to turn color and drop their leaves. The Seattle area is blessed with many sweetgums used as street trees and as I drive around these gray days I enjoy seeing the amazing spectrum of color in their canopy; green, yellow, orange, red and maroon are all present on the tree at the same time. The botanic name was derived by Linneaus in 1753 from the Latin word ‘liquidus’ meaning fluid & the Arabic word ‘ambar’ in reference to the tree’s fragrant sap. The species name styraciflua is Latin for ‘flowing with resin’. The sweetgum is often mistaken for a maple tree because it has a similarly palmate leaf. However, while maple leaves have an opposite arrangement along stems, sweetgum leaves have an alternate arrangement. The sweetgum leaf has 5-7 pointed lobes, but is usually flat along the bottom. The tree also has a distinctive spiky fruit that is bright green in spring & brown in autumn. 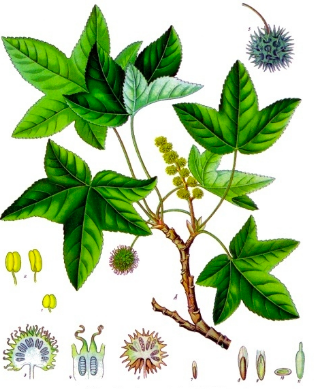 Liquidambar styraciflua is an ancient tree species and was once wide spread, existing all over the northern hemisphere during the Tertiary period (250-65 million years ago). Their location range was reduced due to glaciation during the ice age. Now this tree is native only in the east and southeastern US as well as higher elevation areas in Mexico and Central America. There are four other species in the genus Liquidambar, but they are all native to Asia. The hardened sap was used for chewing gum – hence the common name ‘sweetgum’ – the sap has also been used as incense, perfumes, in folk medicines and for flavorings. The wood is a prized hardwood for its dark mahogany coloring and is used as a furniture veneer. It was the choice for paneling in the original train cars that were built in the United States in the 19th century. In the wild these trees can live up to 400 years. 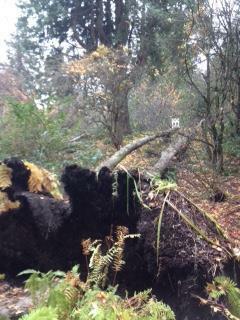 Unfortunately the UW Botanic Gardens recently lost one of our oldest specimens due to high winds. 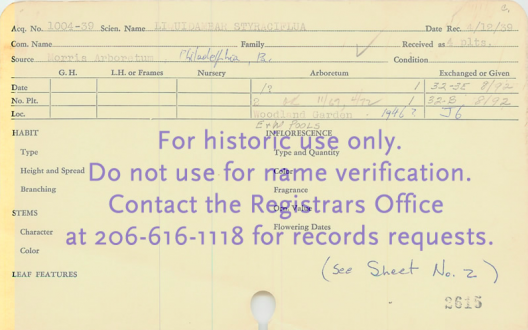 It was accessioned into the collection in 1939 from seed collected in the wild by the Morris Arboretum in Philladelphia. It was over 100′ tall and its canopy filled the sky above the lower Woodland Garden pond; it will be missed. These trees usually tolerate poor drainage, but this specimen may have had a reduced root system as it was very close to a pond and stream. They do readily adapt to our temperate climate and reportedly only do really poorly in alkaline soils.